Dento-facial aesthetics is an innovative brand of dentistry that combines facial rejuvenation treatments with cosmetic dentistry. At Honeysuckle Dental in Newcastle, Dr Anning and Dr Nixon are members of AADFA (Australasian Academy of Dento-Facial Aesthetics). The AADFA was founded in 2009, and its goal is to advance the art and science of aesthetic and facial rejuvenation dentistry to benefit both dental practitioner and patient. Dentistry used to be about getting your teeth fixed. Fillings, crowns, root canal therapy, dentures and braces are what dentists were mostly known for. And then there was cosmetic dentistry. Teeth whitening and veneers became popular methods of improving the appearance of people’s smile, with veneers offering a way to conceal chips and cracks as well as stained teeth. Dental implants have also become a great alternative to replacing teeth that provide the support traditional dental bridges and dentures didn’t. The world of dentistry continued to expand, each decade bringing with it something that improved the patient experience and helped them keep their teeth healthy for longer. Cosmetic dentistry also reached a point where the results can be long-lasting—provided you take care of your oral health—and smile makeovers became the treatment to get when you wanted to completely restore the appearance and function of your teeth. However, for most dentists who offer smile makeovers, they can only offer to fix your teeth. Which, when you think about it, isn’t your whole smile. At Honeysuckle Dental, we can offer you a complete smile makeover by combining cosmetic dentistry with dento-facial aesthetics. Want a treatment that’ll help make you look younger and refreshed? Whether you’re looking to revitalise your lips, soften wrinkles or treat a gummy smile the team at Honeysuckle Dental can help you by providing aesthetic treatments such as wrinkle treatments and lip enhancement treatments. As we get older and the bone in our faces starts to atrophy, our skin starts to sag. Then deep lines, grooves and folds start to form, especially around the mouth. 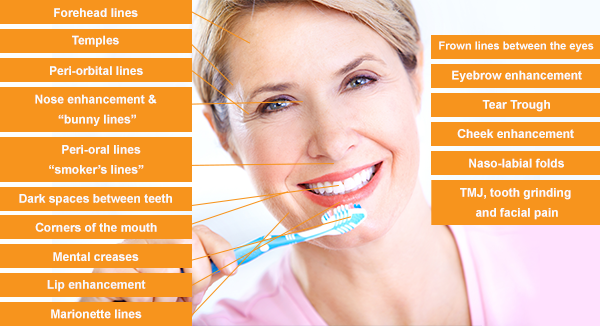 The appearance of wrinkles can dramatically age your smile and your overall appearance. By using a combination of dermal fillers and anti-wrinkle injections, we can rejuvenate the appearance of your face and enhance your smile. Results from wrinkle treatments usually appear 3 to 5 days after treatment and can last as long as 4 months. Anti-wrinkle injections have been used over for 20 years and are considered a safe and effective cosmetic treatment. Wrinkles caused by overactive muscles form on the top of your face; typically from your hairline to below your eyes. With an injectable muscle relaxant, these lines and wrinkles can be treated. Wrinkles and lines caused by loss of collagen are mostly found on the bottom of your face—from below your eyes to beneath your chin. Dermal fillers plump areas of the face which have lost natural collagen deposits. Our lips, which are one of the more prominent aesthetic features of our face, begin to lose volume and become less defined as we age. Dermal fillers are a great non-surgical option for changing the shape, size and volume of your lips. Why go to a dentist for lip fillers and not a cosmetic clinic? To achieve the best aesthetics results for your smile, the team at Honeysuckle Dental look at your whole smile—not just your teeth. Dr Anning and Dr Nixon are both trained in dento-facial aesthetics and are better equipped to understand the relation between your teeth, gums, jaws and lips, and how they affect the complete appearance of your smile. With dentists trained in dento-facial aesthetics, the team at Honeysuckle Dental can provide you with a comprehensive cosmetic smile treatment to enhance all aspects of your smile—not just your teeth. If you would like to know more or to book an appointment, please contact us today.